There is an undeniable romance to bike camping. Escaping the everyday routine under your own power, sleeping outside, the sense of adventure; even the easiest S24Os are thrilling. I’ve experienced this romance on plenty of weekends and holidays, but it had long been my fantasy to sneak in a work-night bike camping trip. Thanks to a recent spate of unseasonably dry and sunny weather in Seattle and two gung-ho coworkers of mine, I was able to make fantasy reality. 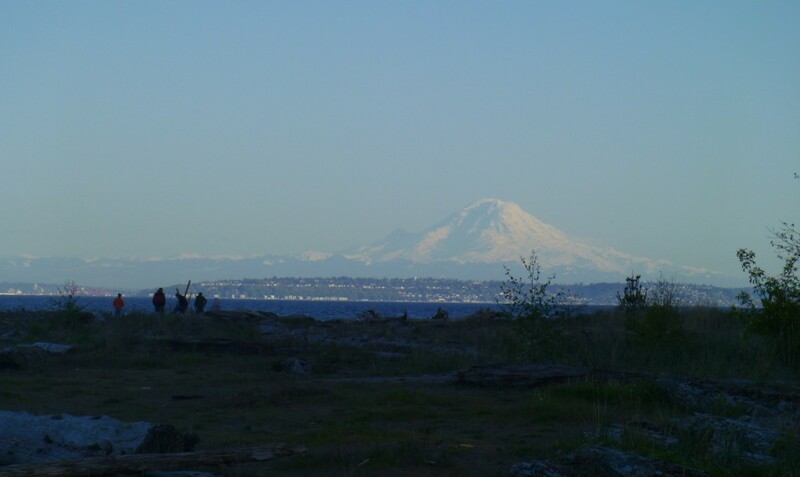 Jeff, Skye, and I wrapped up work at five on a Tuesday and coasted down the hill from our downtown Seattle office building to the Bainbridge Island ferry. Our destination, Fay Bainbridge Park. Short of pitching a tent in your backyard, I’m not sure S24Os get any easier than Seattle to Fay Bainbridge. A 35 minute ferry ride and a seven mile ride on low-traffic roads and you’re there. 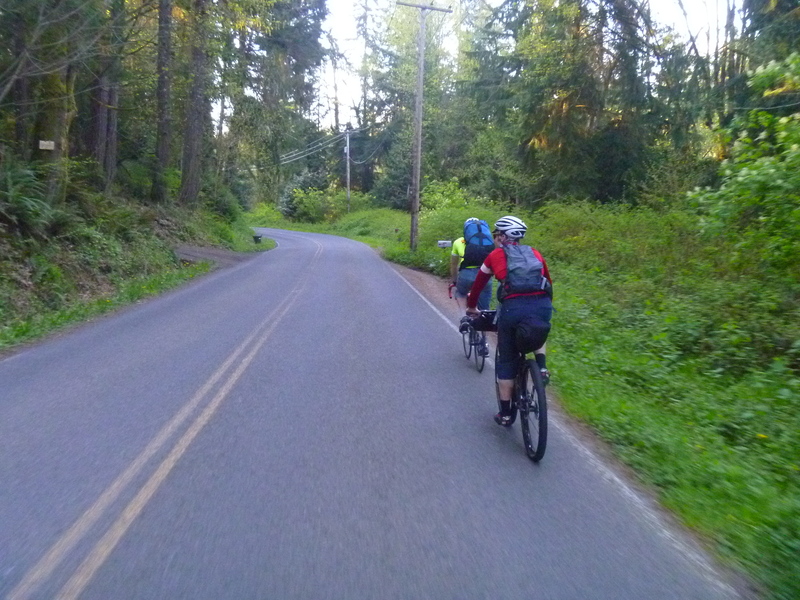 Bainbridge is hilly, to be sure, but the ride is short enough that anyone could grunt their way through. We used our 35 minutes on the boat to drink a beer and lay the ground rules for this trip (essentially the only rule was to try to minimize complaining about work to each other). This was, as Jeff pointed out, a micro vacation worthy of celebrating. After disembarking the ferry, we made a quick pit stop in town to stock up on dinner supplies. From there it was just a casual 40 minute ride to the park. Fay Bainbridge Park is divided into an upper and a lower section. The upper section is wooded and has a few campsites. 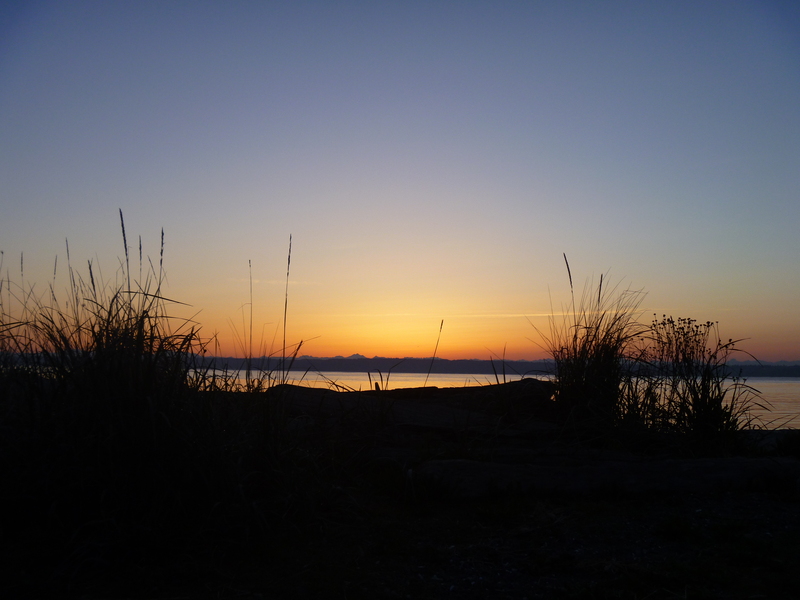 The lower section is right on Puget Sound and has a beach and campsites in a large field. And while the park is simple and small, it boasts some incredible views. 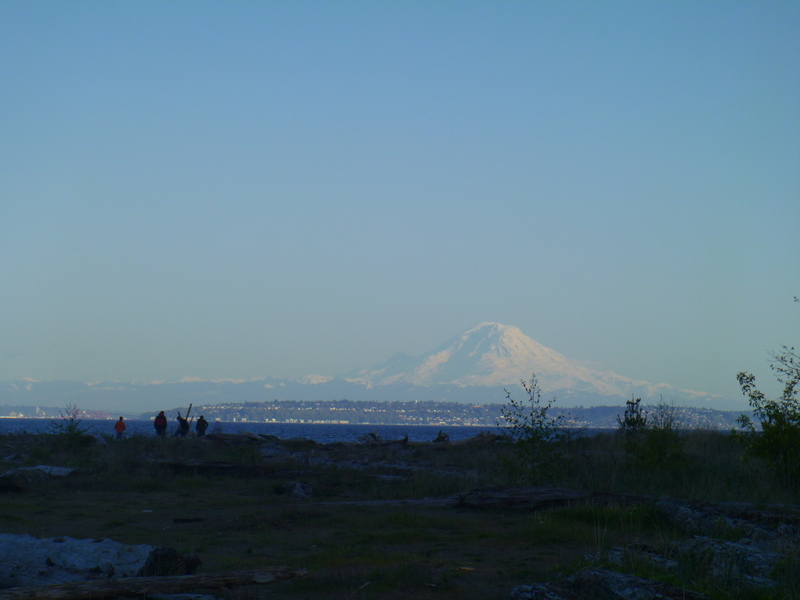 Clear and sunny day that it was, we had an inspiring view of Mount Rainier looming far to the south behind Seattle’s skyline. Directly east of our camp, we could see the snowy peaks of the central Cascades. I’m lucky to live in such a beautiful place. When we arrived we nearly had the park to ourselves. One family was wrapping up their barbeque on the far end of lawn. The rest of it was totally empty. We picked our site based on the remnants of an afternoon campfire still smoldering in the firepit. As luck would have it, we also found a stack of firewood that someone had left under a nearby picnic table. Skye used his boyscout skills to revive the embers into a nice fire and we settled in for dinner. With a zero percent chance of rain in the forecast and a relatively warm overnight low of 42, we all opted to bring bivy sacks instead of tents for the sake of weight and space. It was my first experience sleeping in a bivy and I found it to be generally pleasant. It might’ve been another story if it had been raining and I needed to zip the bivy over my face, but I lucked out and didn’t have to bother. It turns out Elliot Bay stays busy and noisy through the night. I awoke several times to the sounds of trains motoring north out of Seattle, cargo ships heading into and out of port, and the wakes from boats lapping onto shore. A fair trade for the opportunity to sleep out under the clear, starry night between stints at my desk. Slightly better view to wake up to than my beige bedroom wall. I woke up at dawn and pulled out my camera to get ready for the spectacular sunrise that was about to crest the mountains. The oranges and yellows and reds and pinks lighting the Sound were truly remarkable. Once we’d had our fill of sunrise photos, we broke down camp and fueled up on bananas and instant coffee to get ready for the ride to work. Our ride back to the ferry was a bit more urgent than the previous day’s as we needed to make the 7:55 boat to get to the office on time. As such, we took a higher traffic, but faster route down Bainbridge’s main highway and covered the distance in only 30 minutes. Another 35 minute boat ride and a steep climb away from the water and we were back at the office. I had plenty of time to shower and grab a breakfast sandwich and still get to work at 9am. As I dug through the morning’s pile of email, I thought about the amazing break we’d put in our routine the previous night. On an average Tuesday, I’d probably be at home watching TV or reading or out at happy hour with friends or something else worthwhile, but nonetheless mundane. Instead I joined two friends on an awesome adventure, slept outside by a campfire, woke up to the glow of a Cascadian sunrise. It almost felt like we’d gotten away with something; like we should keep our mini adventure a secret because we broke the rules. 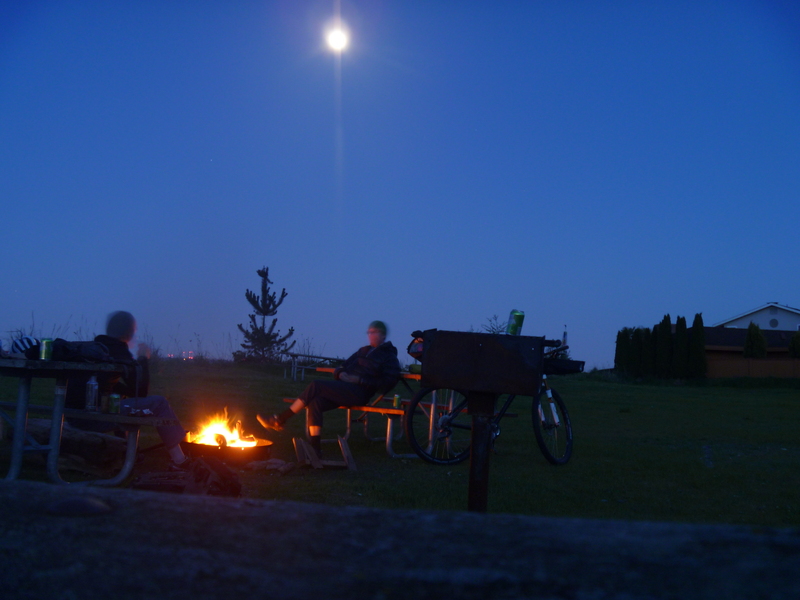 Looking ahead this summer, I hope I can get away with many more weeknight bike camping trips. 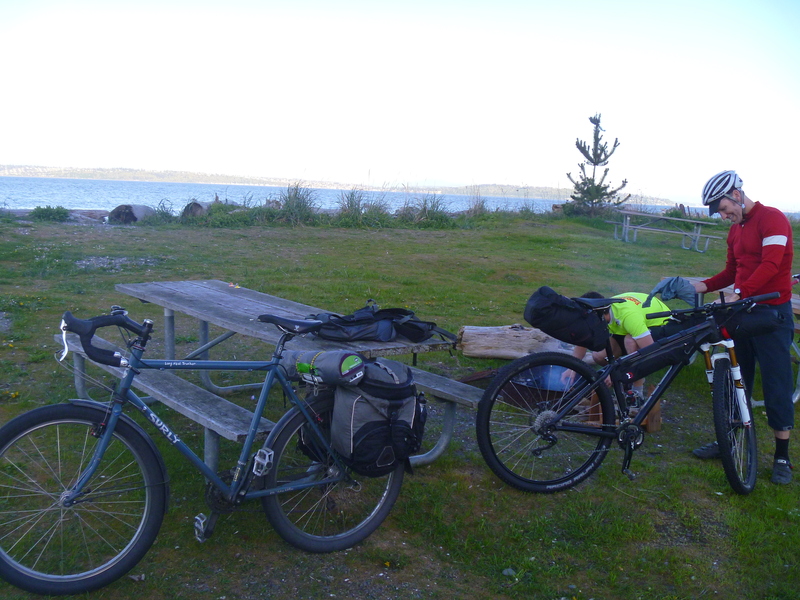 This entry was posted in Adventure, Bike Touring, Everything Else and tagged bike camping, s24o, worknight bike camp. Bookmark the permalink. Great story, Josh. And thanks for the reminder that I’m a little lacking in the “midweek magic” department. I haven’t managed to squeeze in any s24O since we started doing longer tours. Which is pretty dumb when I think about it. Must do better. This is a great little adventure and really motivating.